Miss the Paris and New York fashion shows? It’s OK — we’re not here to tell you what Dolce & Gabbana or Little Marc Jacobs has in store. Rather, it’s already back-to-school shopping time, and a quick scan of your kids’ closets reveals jeans with blown-out knees, juice-stained tees and unintentional peep-toe sneakers. How can you get out of the mall alive with a few cute outfits or items in the bag? Never fear, fair-weather fashionistas. We’ve rounded up the hottest fall trends by age group (so you don’t have to). 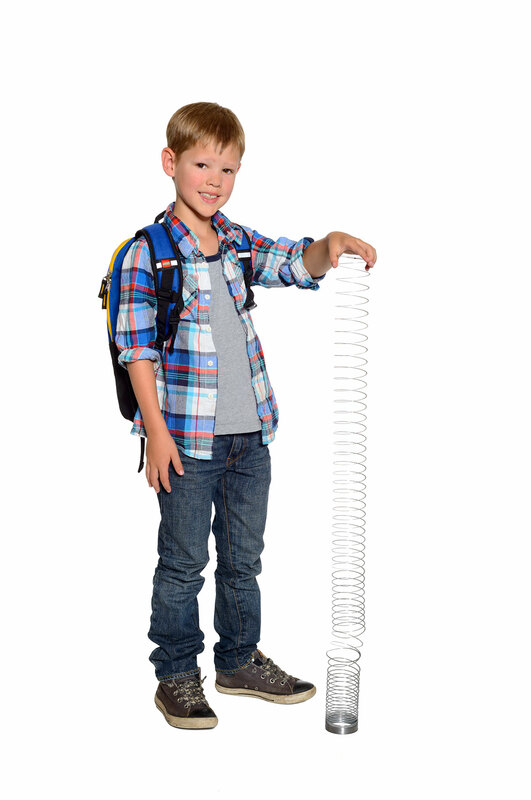 Win a back-to-school shopping spree! 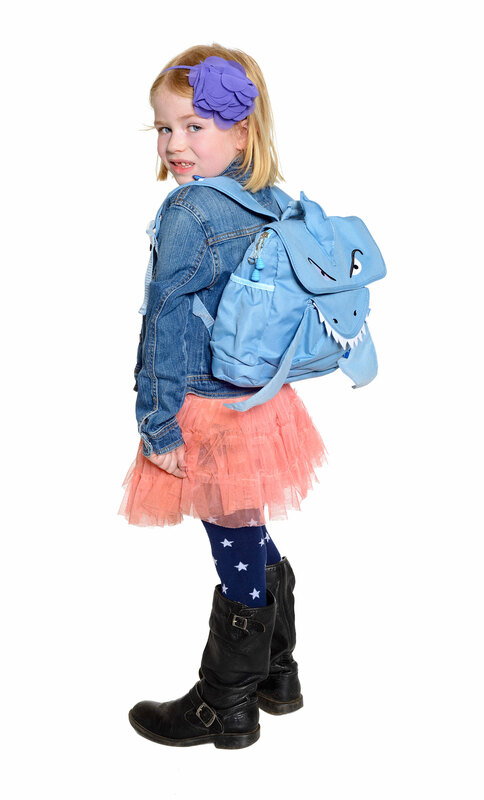 Got a kid with an eclectic sense of style? Geometric patterns and a mishmash of prints, color and textures are big this season, so it’s fun to throw it all together and see what works. To keep it from looking too cluttered, layer in threes: three complementary colors, three patterns, three pieces. A chunky sweater paired with striped tights, a polka-dot skirt and a screen-print tee; or a color-block tee or sweater paired with a plaid jacket and preppy embroidered pants. Vibrant shoes and accessories finish the look. 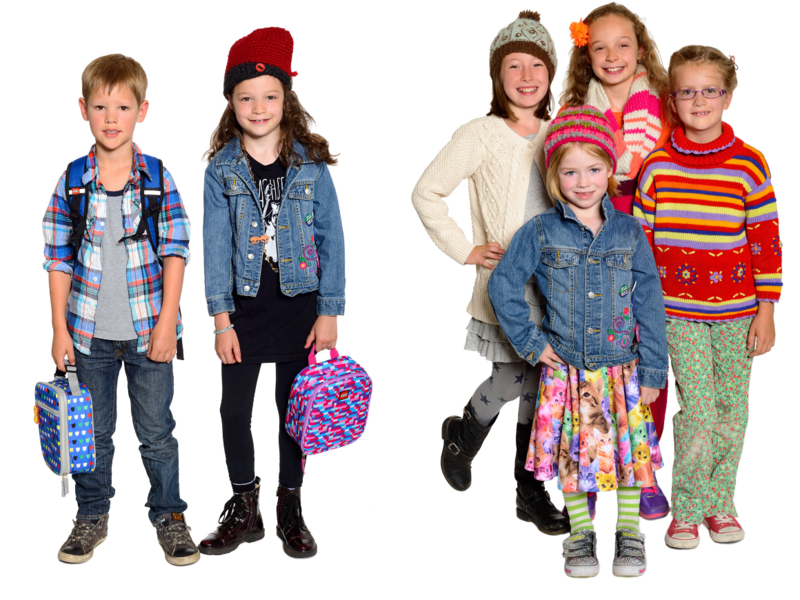 Shop: Mini Boden, Hanna Andersson, Gap Kids, Splendid. Think nostalgic, chunky knits, camping motifs and fleece so fabulous that that your kids will look as adorable as a bunch of stuffed animals. For girls, fluffy faux fur vests are all the rage: Be on the lookout for fun colors (pink, blue, yellow) as well as animal prints. Woodsy themes (frogs, bears, foxes) and whimsical camping prints are trending for boys. Shop: Nordstrom, Bloomingdale’s, Crewcuts, Mini Boden. Taking a cue from varsity sports, this tried-and-true look never really goes out of style, but instead gets a fresh seasonal update: letterman-style jackets and tees, retro-style racing stripes, color-block baseball tees and stylish but still comfy track pants. And don’t forget the statement sneakers, trending with bolder-than-ever designs. 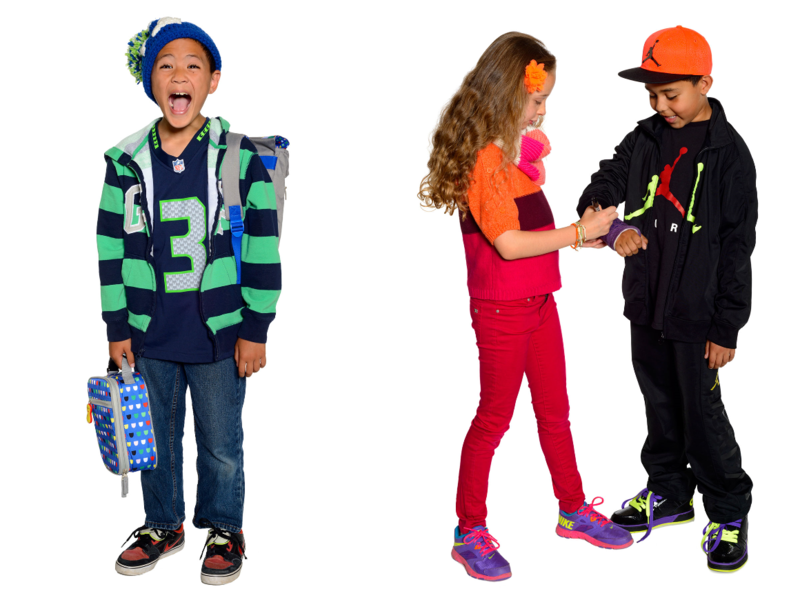 Shop: Macy’s, JCPenney, Big 5, Ivivva, Nike, Gap Kids. Tulle for school? You bet. Not to be confused with the toddler dresses you might find at the costume store, this version of “fairy wear” is more a case of high fashion meets everyday chic. For school, the key is to balance the femininity with an edge. Layer a frilly ballerina skirt with a sporty sweatshirt, delicate tee, biker jacket and tall boots. Leave the tiara at home. 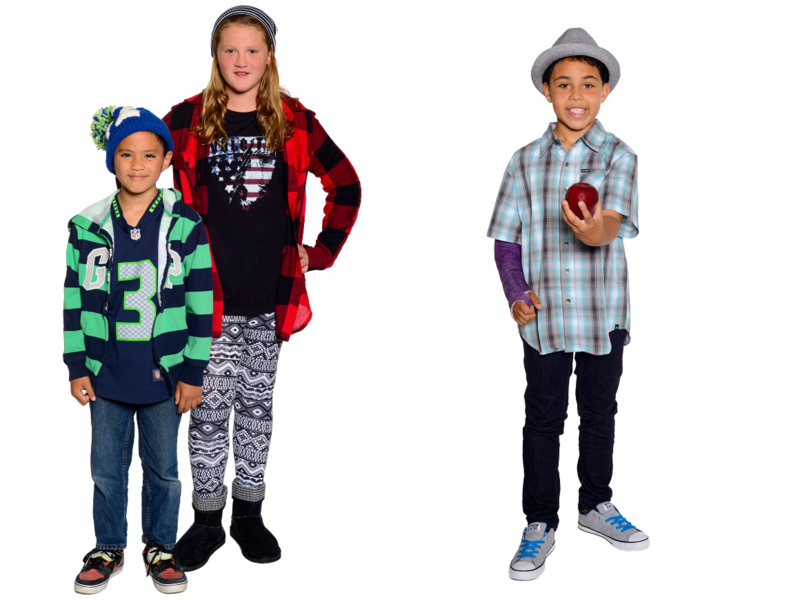 Shop: Crewcuts, Nordstrom, The Children’s Place. Much has been written about the double standards of tween fashion and how hard it is to find wholesome, appropriate clothing for kids this age, especially girls. Speaking as someone who has both worked in the fashion industry and raised a tween daughter, all I will say is that this can be a trying time, and fashion battles may or may not be won. Just remember that they’re growing fast now, so they won’t be wearing these trends for long. For every mom who’s rolled her eyes at the kids-in-yoga-pants craze (while wearing her own yoga pants), in comes a trend you simply cannot ignore. Galaxy swirls, kitties, candy wrappers, Aztec patterns, florals — there’s no limit to the conversation potential of these statement pants. What started out as an ironic trend among millennials is now trickling down to tweens, so to keep your wits about you, here’s a rule: If the pants are crazy, keep the rest of the outfit neutral and toned down. Shop: Amazon, Forever 21, Rue21, Target. Instead of the ripped-up jeans and see-through tees of fashion trends past, steer your tween toward this season’s Western-meets-grunge trend. Distressed jean jackets, faded and embellished jeans, and rock ’n’ roll T-shirts offer just the right amount of edge, and fringe-trimmed jackets and slouchy flannel tops pair beautifully with this season’s tall boots and chunky footwear. Turquoise accessories, knit scarves and floppy hats finish the look. For boys, chukka boots, Army-style jackets and knit caps are both fashion-forward and utilitarian. Shop: American Eagle, Free People, Old Navy. What was once limited to shoes and accessories is now trending in tops, dresses, pants (see crazy leggings, above) and tees. How to pull off the look without going overboard with the glitter? Look for iridescent fabrics in simple silhouettes (dresses, jackets) and subtle detailing in tees and sweaters. With the 1970s “summer of love” trend nearly behind us, fall brings new teen fashion themes inspired by the culture of other decades past, including the music of the 1980s and 1990s. Vintage band tees, gothic accessories, distressed denim, studded silver accessories, chunky boots, and black, black and more black — this isn’t exactly the ’80s punk of your youth, but with comfy leggings and oversize sweaters as the foundation of this trend, you may want to consider sharing a few staples with your daughter. For guys: Black jeans and a simple rocker tee say it all. Shop: Urban Outfitters, Abercrombie, Craft & Culture, Hollister Co., Band-Tees.com. Military-style jackets are making a comeback, this time with a marching-band-inspired vibe (think 1980s Michael Jackson). Look for double-breasted detailing, contrasting colors, and gold and iridescent embroidery. The band jacket is a unisex statement piece that pairs well with denim. Shop: ThisNext.com, vintage stores, specialty boutiques, Nordstrom. Not that far off from last year’s trend of leggings plus infinity scarf plus booties, now the look gets slouchier and cozier, with tall, sturdy boots, chunky sweaters, plaids and woodsy motifs, such as owls, trees, deer, and tribal and Native American–inspired prints. For guys, Timberline boots, cozy knit caps and distressed denim will get them trekking through high school and beyond. Shop: American Eagle, Anthropologie, Free People, Eddie Bauer, REI. 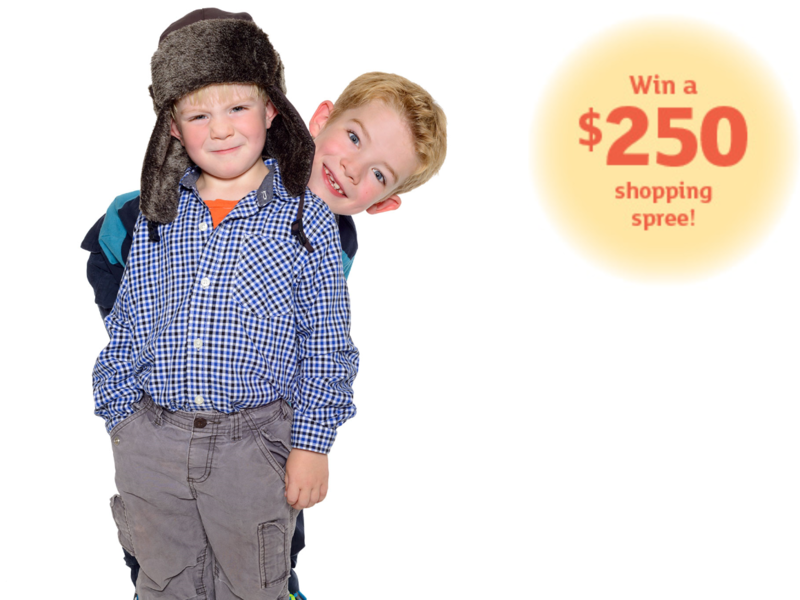 Click here to enter to win a $250 back-to-school shopping spree to Redmond Town Center!